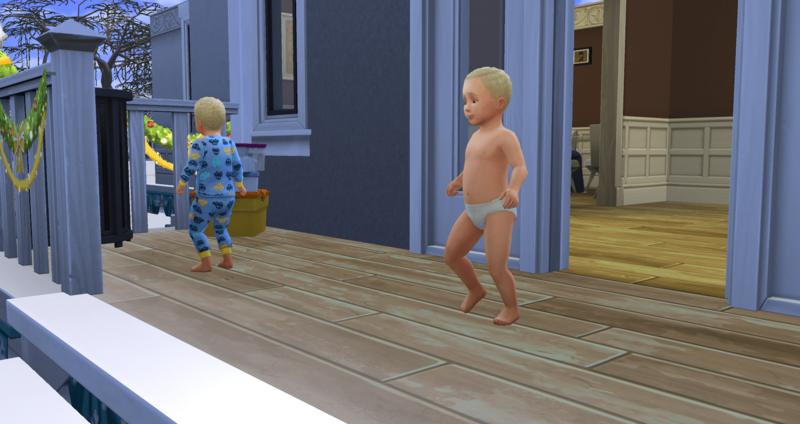 I went through and split the kids out to their own households for now. As you can see, MCCC is doing its thing and there is cross-pollinating taking place. 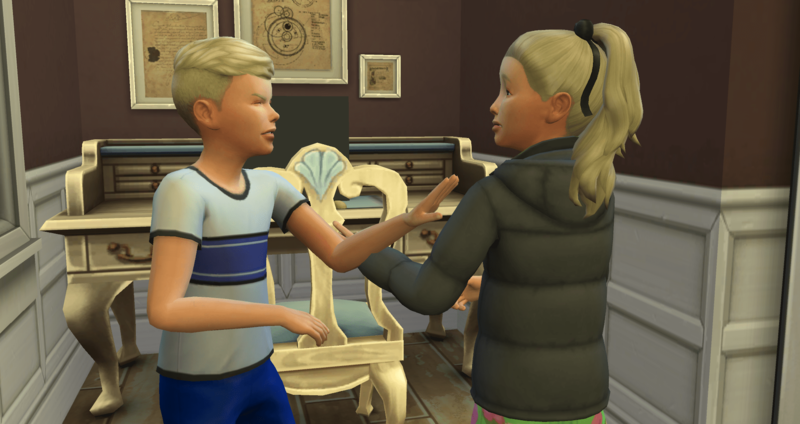 I tried to keep up with the family tree on the Baby Boom and just about drove myself insane, so no promises on how long or how much I will update the kids after they move out. 😛 You can also tell MCCC just kicked in since the kids are all still toddlers. 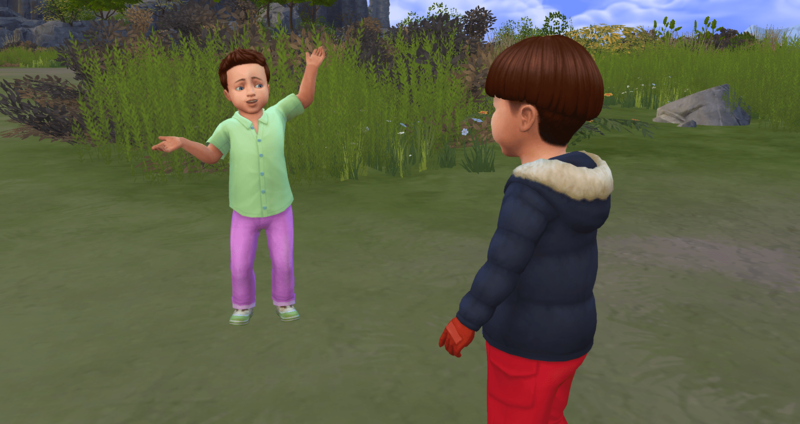 Welcome back to screaming babies 🙂 This is about what my day felt like – without the babies, just the screaming. And I have an ulcer on the back of my tongue so it hurts to swallow. Moving on. It is also Winterfest, which means no school for anyone. 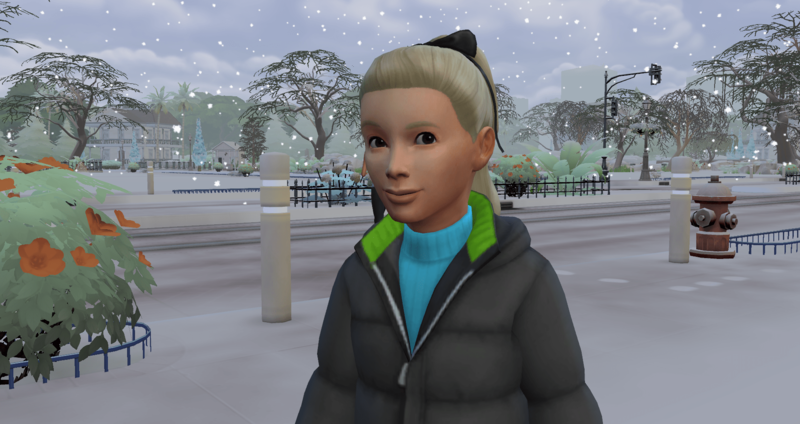 Riviera is a loner so she heads outside to shovel snow and to get away from everyone for a little while. This is probably the only break she will get today. 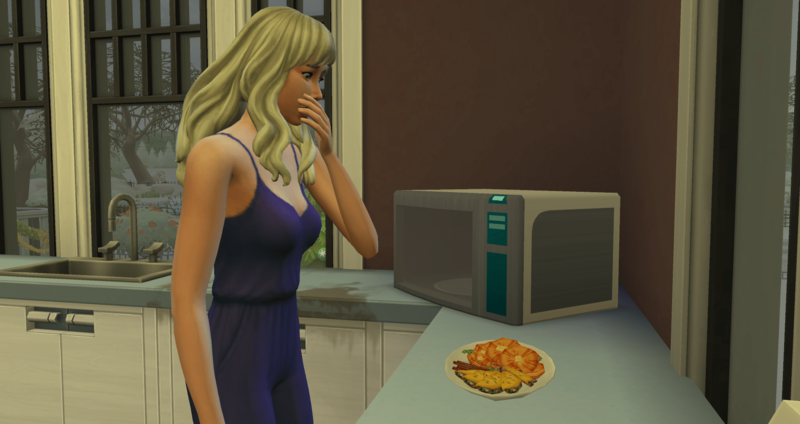 Merry is in the kitchen making a Grand Fest for breakfast when the starving monsters wake up. Actually Niagara wakes up first. 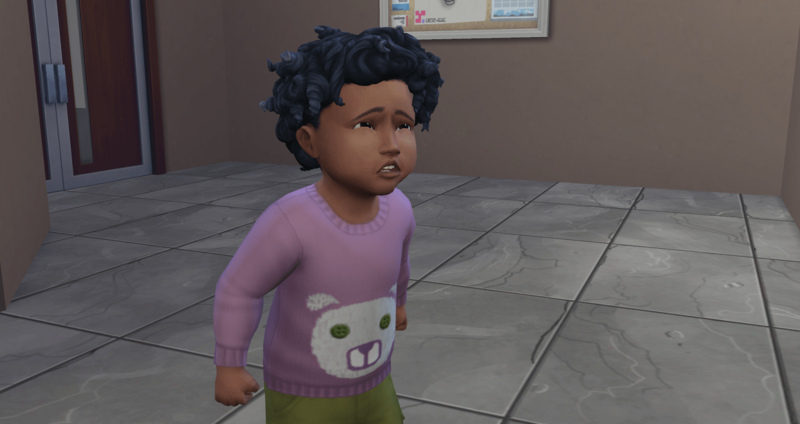 Screaming tantrums are the order of the day. She wakes up Normandy in the process. 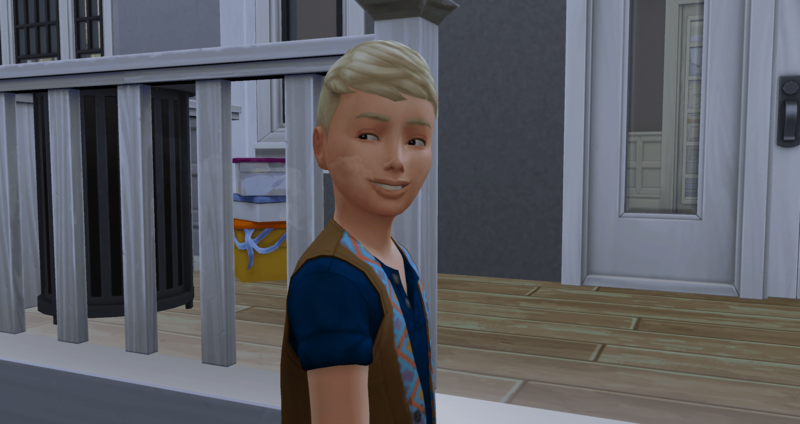 After Merry finishes all of the work to make the breakfast, I notice that the only person who cares about the Grand Meal is the Angelic toddler – Normandy. Merry and Sahara ignore the tradition because they are Mean. 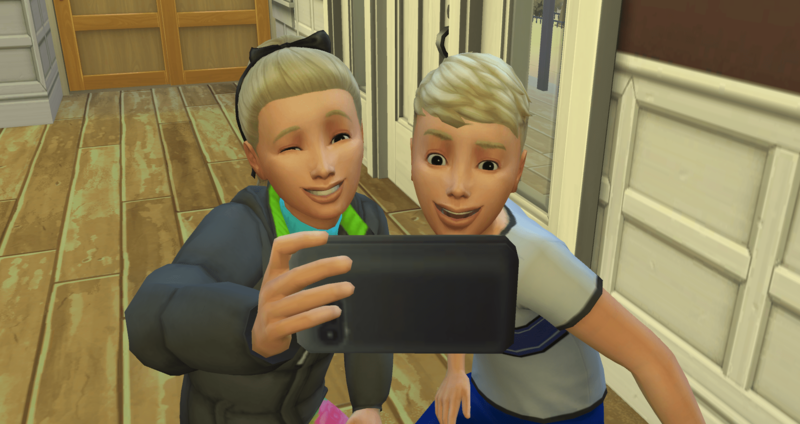 Riviera and Rushmore ignore the tradition because they are teens. 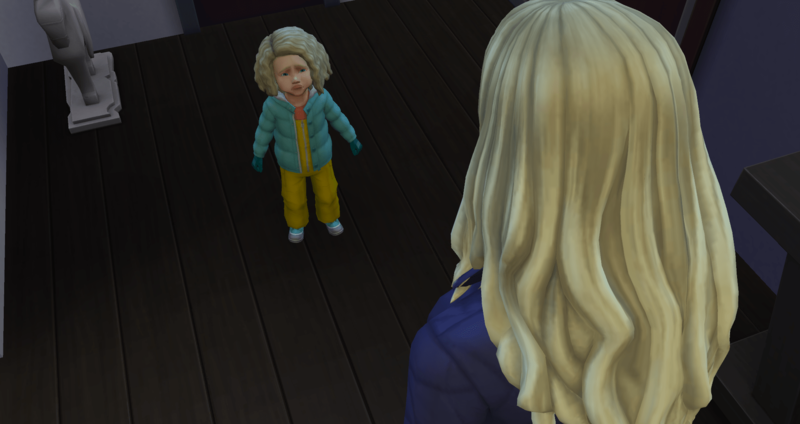 Niagara ignores the tradition because she is a toddler. 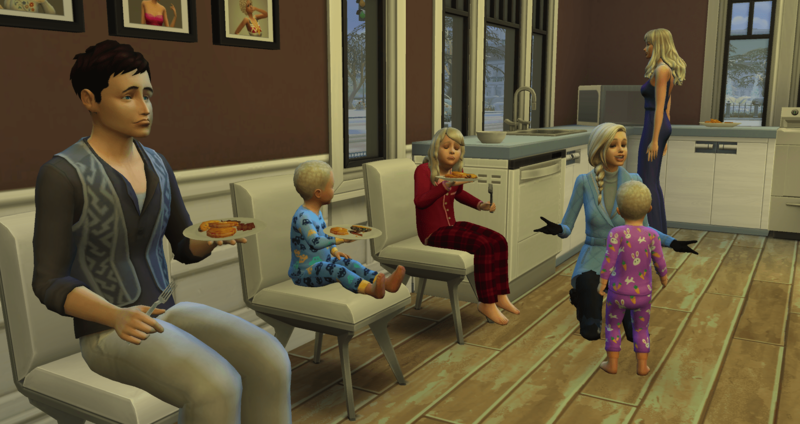 Basically, Merry made the Grand Feast for one toddler. 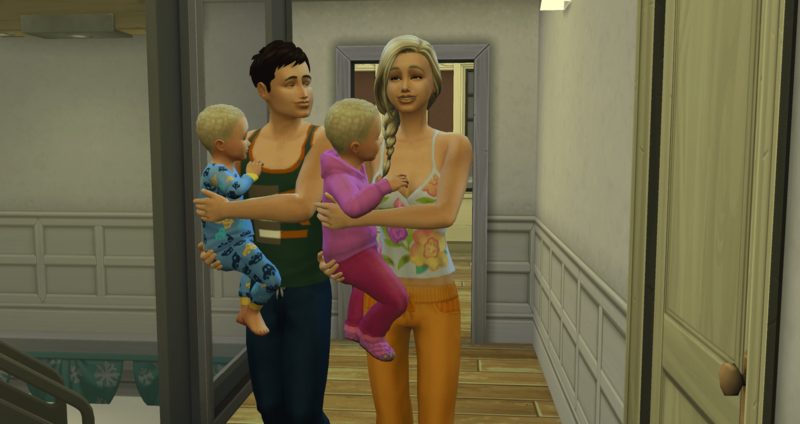 The family is at least all in the kitchen, minus the newest babies. They don’t even bother to sit at the table. Merry, Niagara, and Riviera already ate leftovers before Merry made breakfast so they aren’t hungry. 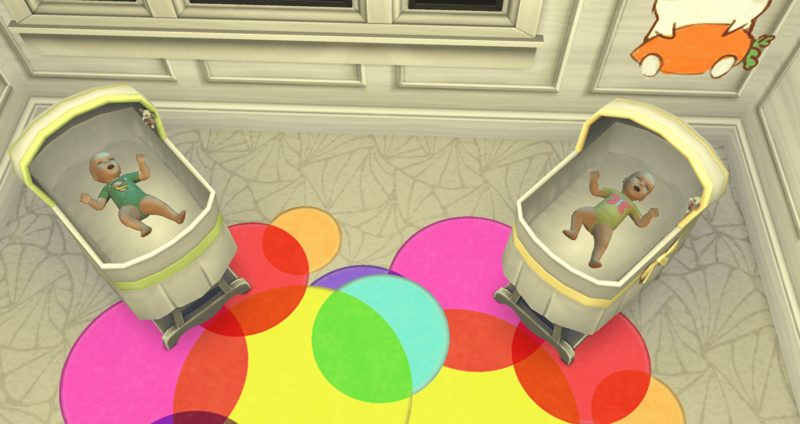 Yeah, here we go again – naked baby in the freezing weather. We will not see Niagara in clothes again today. 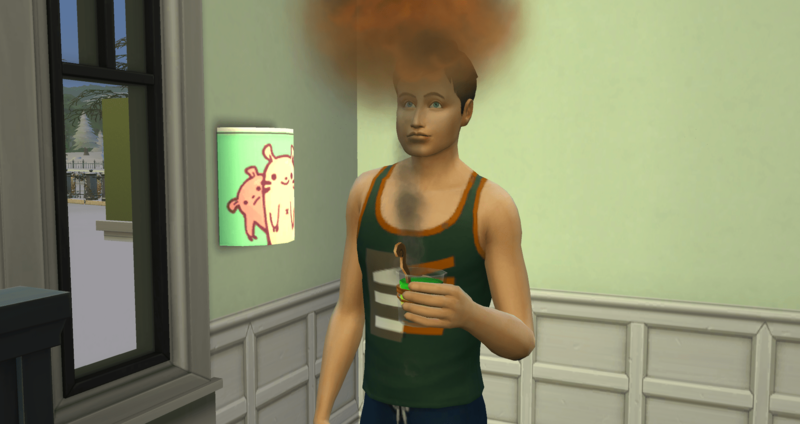 Normandy was playing in the trash and then Niagara went streaking. It is time to open presents. 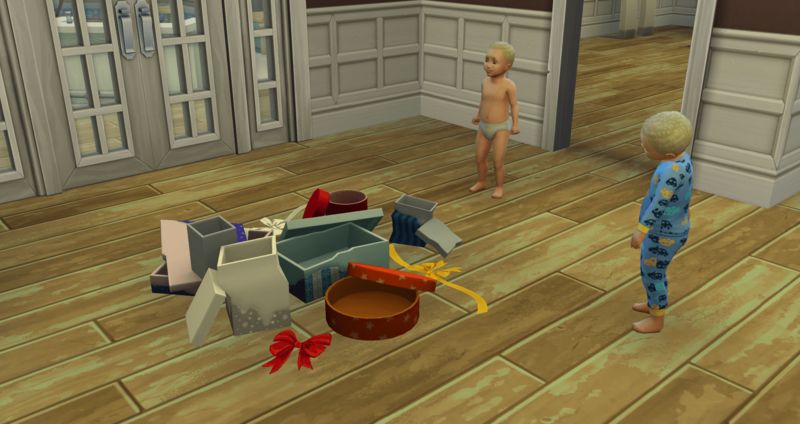 Apparently, saving the pile of presents from one season to the next isn’t a good idea. It collapsed after N&N opened their presents and I had to buy them another pile so the rest of the family could open presents. Niagara is really being a pain today – She has been in every trash can, she is wild and revved-up, and it is showing today. 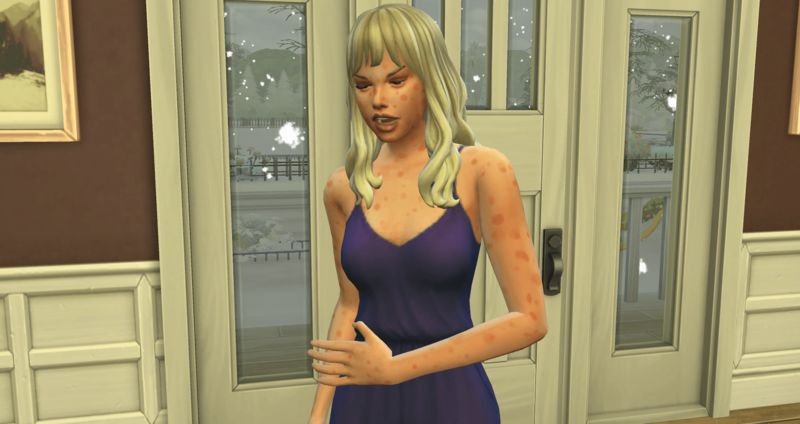 That looks very painful and contagious. Don’t touch anything or anyone! 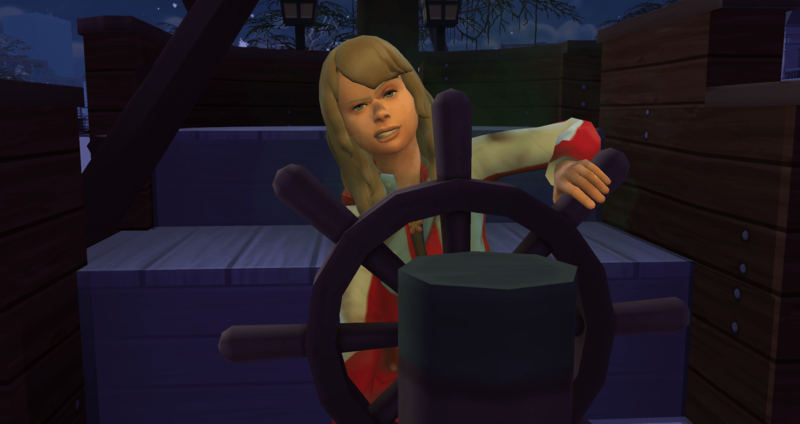 It has also made her grouchy-er. I caught her yelling at Niagara three times. Not that is unusual for her to begin with. So Merry asked Niagara if she had been good or bad – apparently Niagara doesn’t think she has been good because her thought bubble was “no presents”. 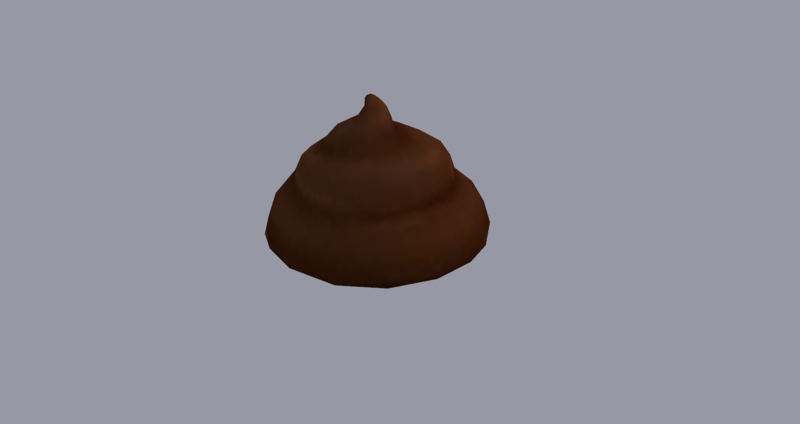 Sahara got a pile of Large Pet Poop – the stinkiest and smelliest of all the pet poop. Play time – which just revved her up some more. I basically just let them go on free will today and followed them around and took pictures. 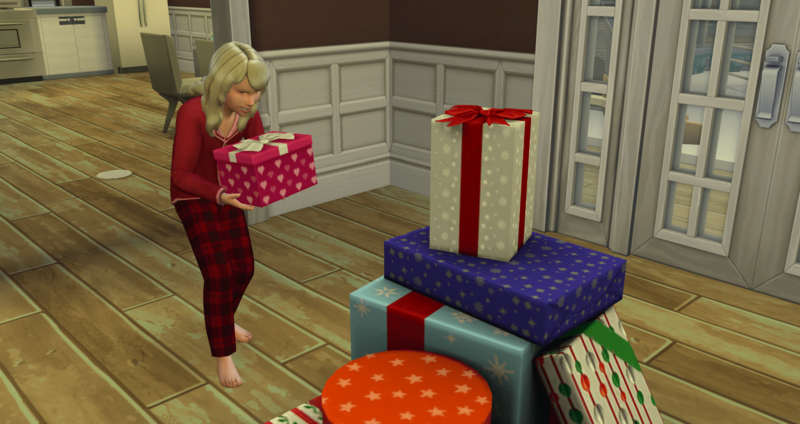 Except for opening presents, I kept bringing them back to open presents whenever they could to use up the pile of presents. Family time around the presents – cause the tree is outside. Synchronized cuties. Riviera and Rushmore asked each of them if they were good or bad and they both answered good this time. 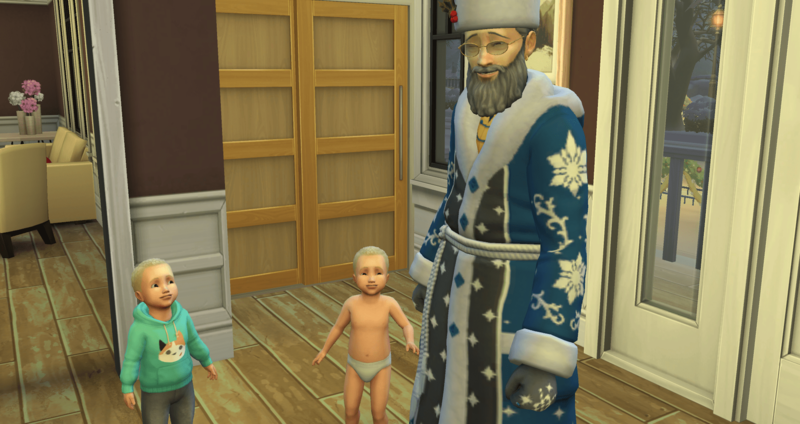 Father Winter is here! They were both so tired that they took a nap on the couch while they waited for him to come. It was a battle, but they managed to stay awake long enough to ask for a present. 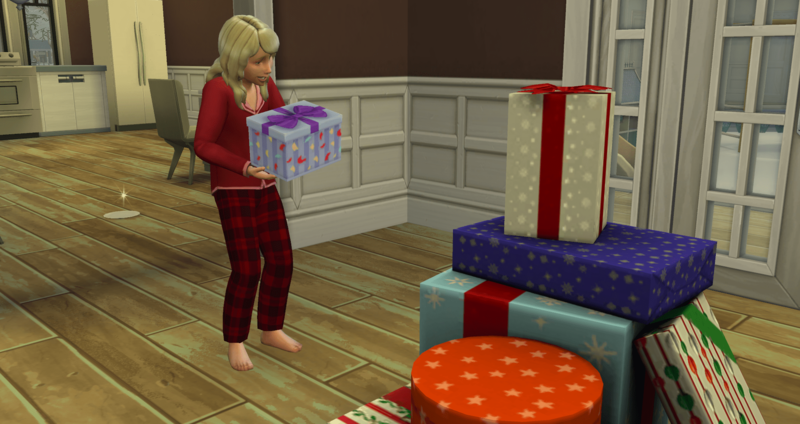 Sahara was able to ask for a present also and complete her holiday traditions. She was the only one that wasn’t already in gold for the holiday. And with that, it is time for everyone in the house to go to bed. 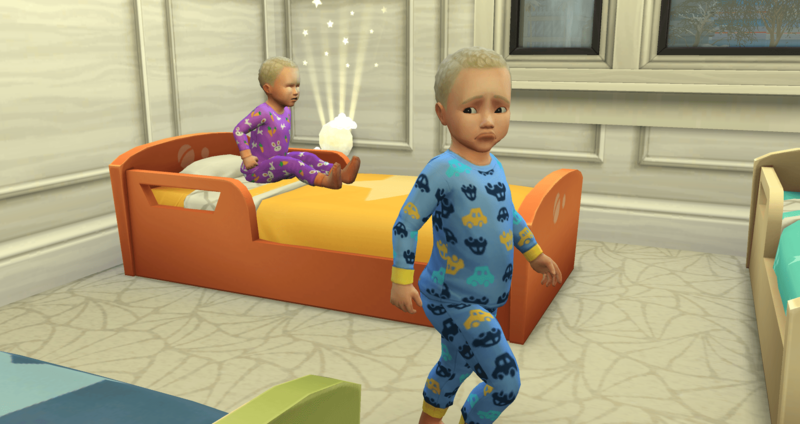 Merry crashed a long time ago – she has been trying to keep up with the babies needs. 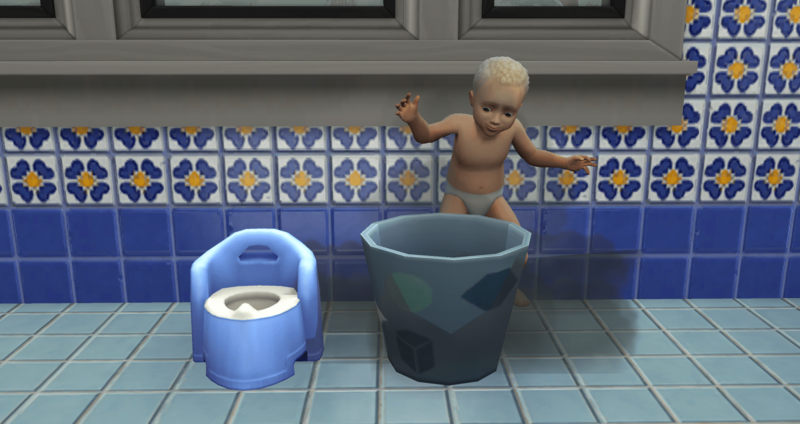 Babies who are about to become toddlers also. 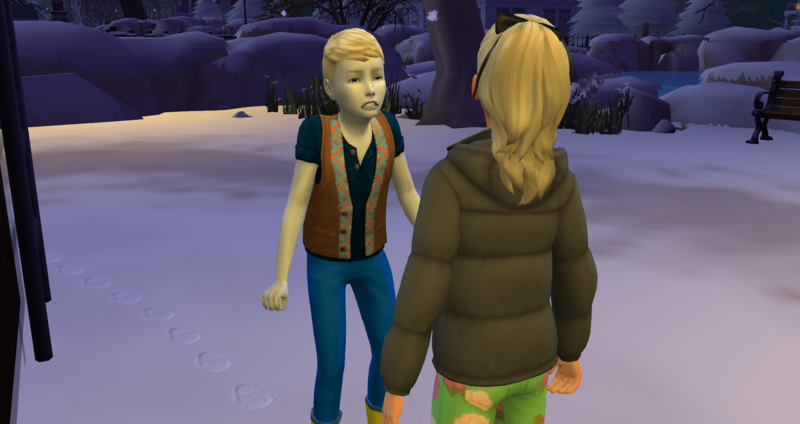 Niagara is back in clothes because after Father Winter gave them their presents they slipped away and went to bed. 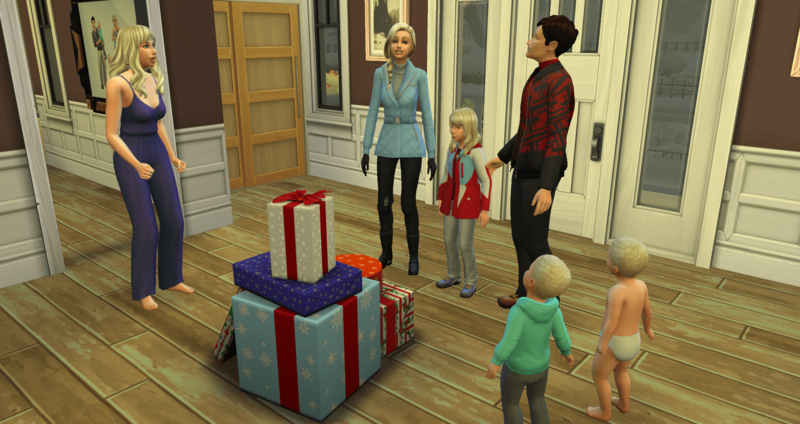 I was with Merry taking care of the babies and realized the pile of presents still had available gifts for everyone – Father Winter had reloaded it. 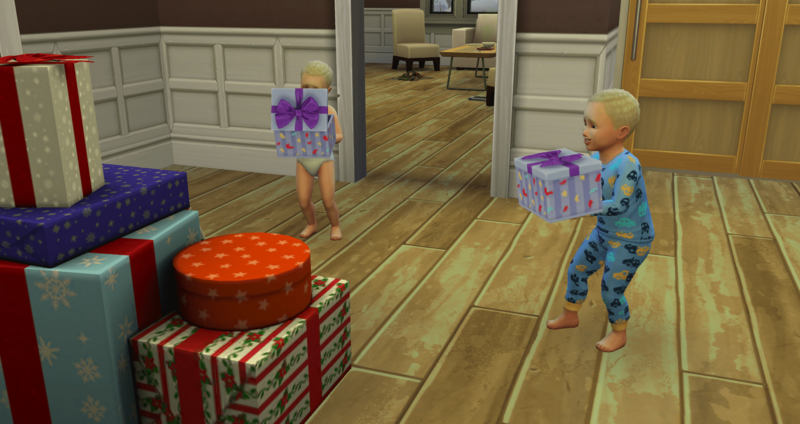 So everyone had to get up and go open more presents. Somewhere in there, I believe someone gave Niagara a bath because her hygiene was low – playing the trash stinks, you know. Anyways, they dressed her after the bath. Otherwise she would still be only in her diaper. Teens are so helpful sometimes. 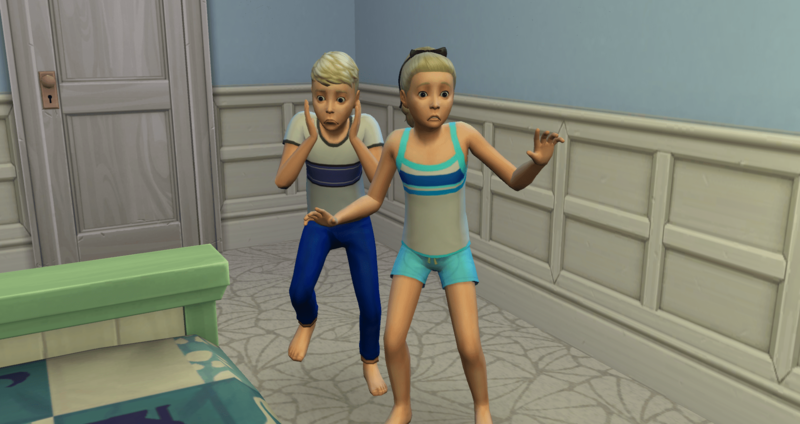 When N&N wake up the next day they find out it is their birthday! Woot! 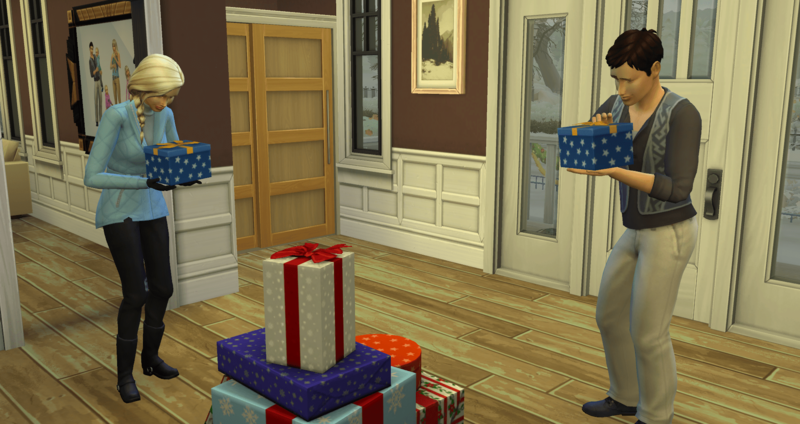 Niagara has maxed out three skills and while Normandy hadn’t done quite that well, they were 2 days till age up and had earned their cake. Niagara is a Neat – Social Butterfly – must complete this!!! So London is not a genius, that is pretty obvious. I tell him to change clothes and this is what he puts on. 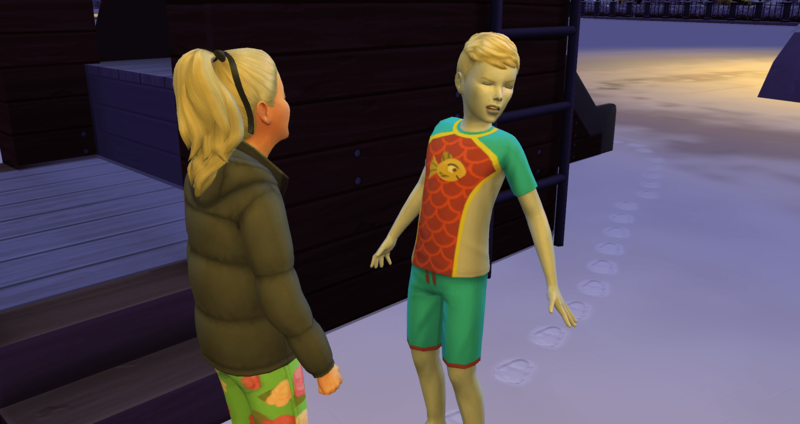 Okay, I admit, I clicked on the window before the image loaded and I thought it was the cold weather clothes – apparently it was the hot weather clothes. My mistake. Finally, the boy might survive the night. Sahara looks on with ?longing?, or maybe she just wishes she was as clean as they are. 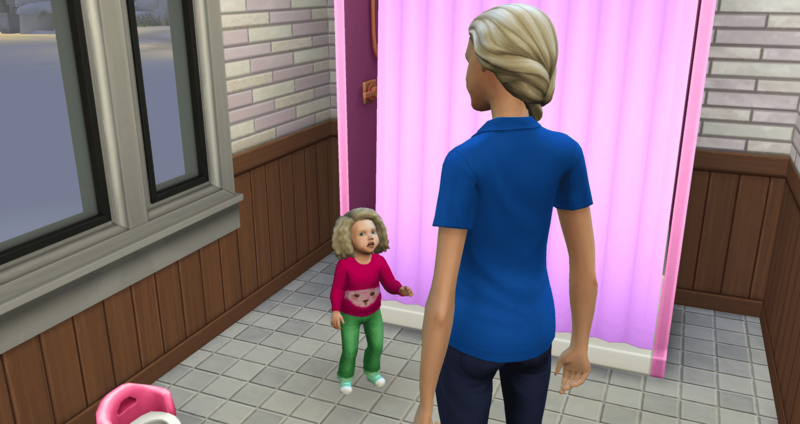 I won’t let her go home because the newest toddlers are being potty trained and the bathrooms are not free for her to take a shower yet. Our first defiance comes from Lourdes. 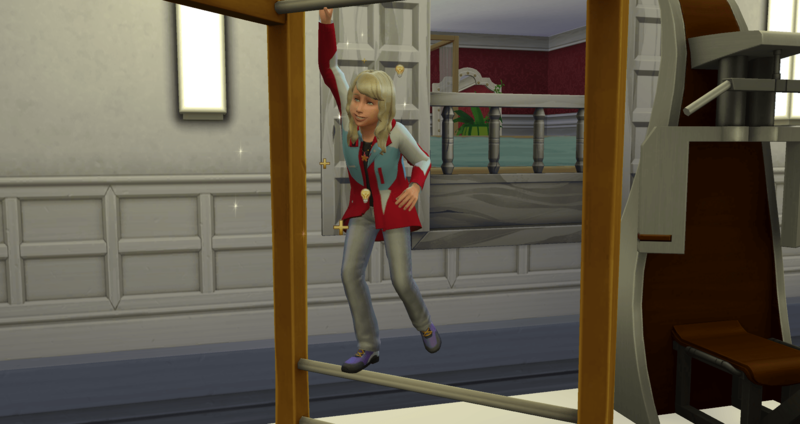 And Sahara has completed her aspiration. Now she can go home and sleep. 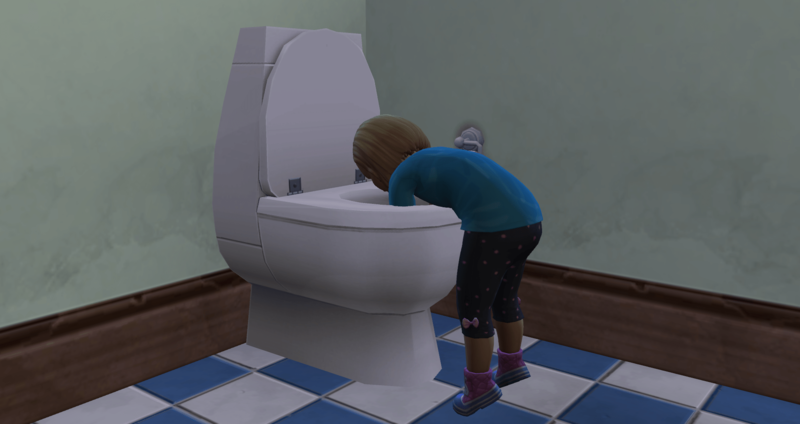 Tomorrow she can shower, then go to school, and when she gets home, maybe she can have some cake. The monsters don’t come out often, but they got both Normandy and Niagara tonight. 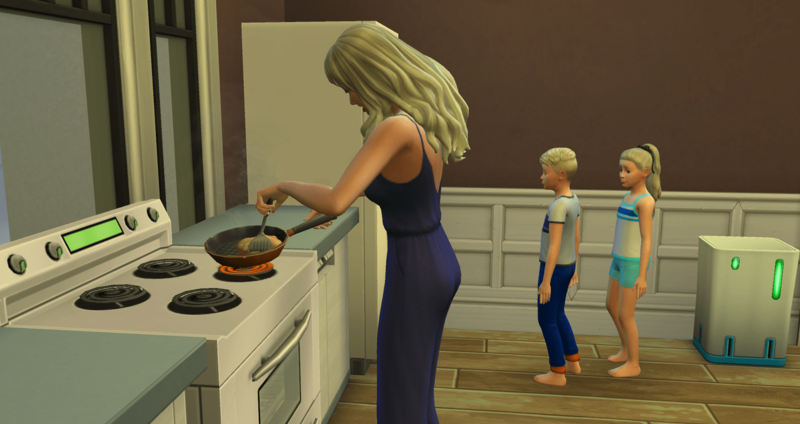 They were so scared that they had to stand by Merry while she cooked breakfast. I don’t know why they just stood there the entire time. But they did. 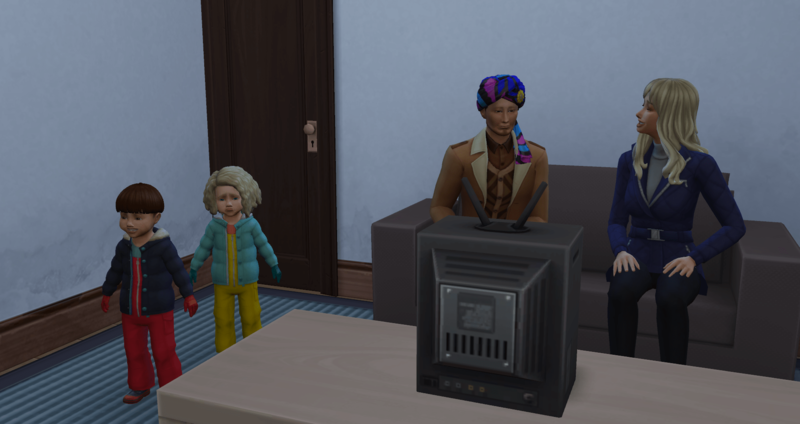 Once the kids all went off to school, Merry bundled London and Lourdes up and they went off daddy hunting. I had a list and Merry needed to introduce herself to as many as possible. They weren’t all home and a few had aged out of the range – I am trying to not abused the elders – but she made four contacts. 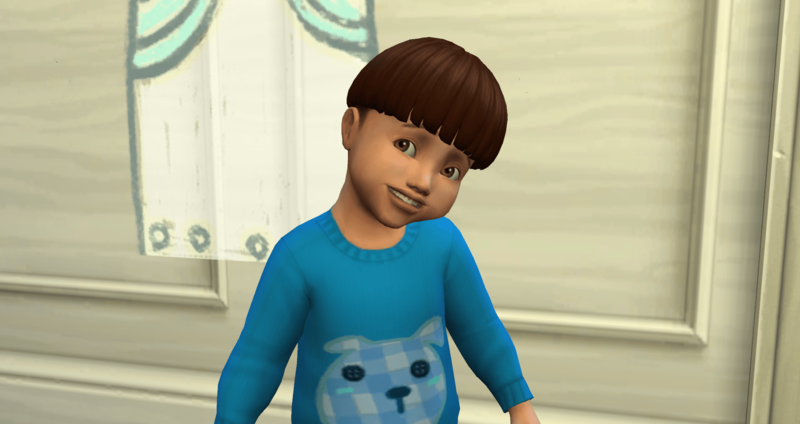 I am just appreciating all of the toddlers that are not mine. Then as I am thinking that thought, Lourdes heads for the first toilet that was not in use. Merry went after her and caused a traffic jam in the bathroom. 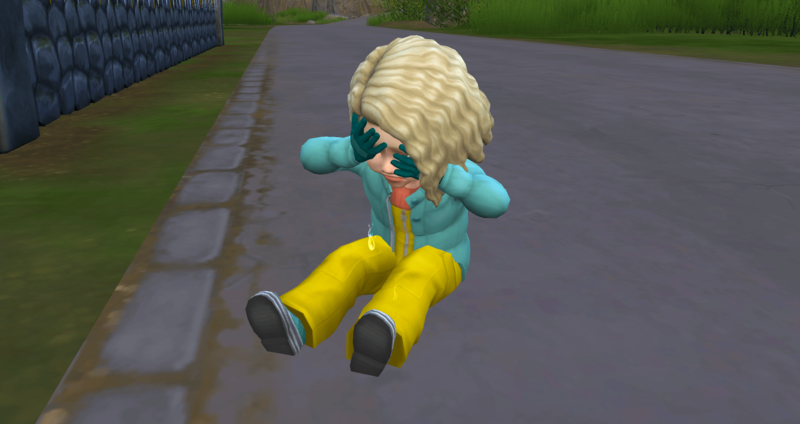 Lourdes staged a sit-down cry, in the road no less, at the next house. At the last house, L&L met up with some other punks their size. 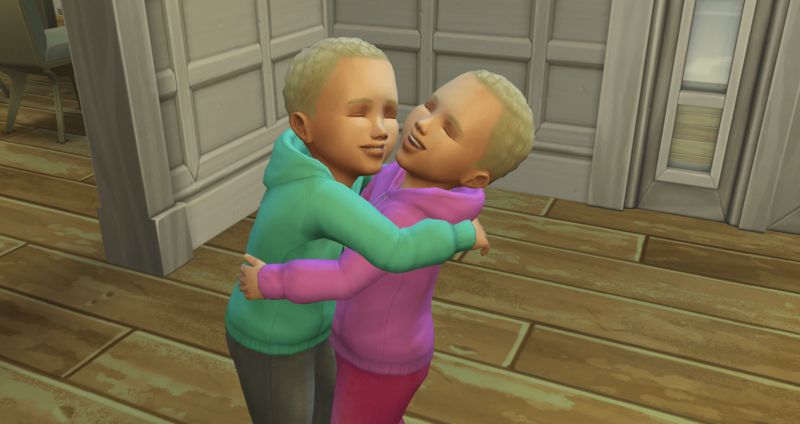 They talked long enough to finally stop hiding behind their hands. 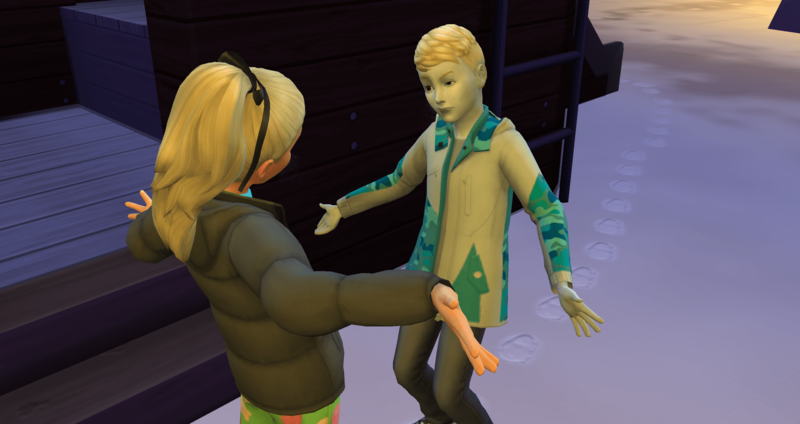 This is the first time this has happened – Merry invited Hugo over and they were getting all romantic and the option came up to Try for Baby – and the house is full. Wha? Oh yeah – Riviera and Rushmore haven’t move out yet. Why? Because they still need to get promoted at work. They have had a rough week. 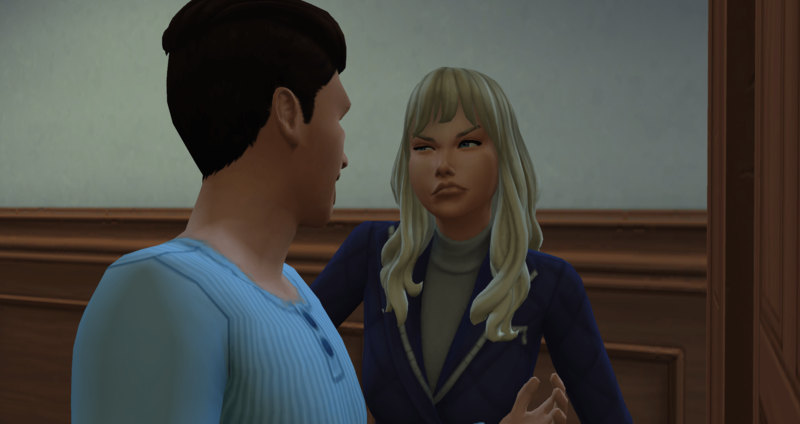 First I went into CAS for makeovers and it popped them back home – I know it cane happen but it normally doesn’t do that to me, so I don’t think about it. Then they were in bad moods from school, then it was a holiday. Now it is Friday and tomorrow is Saturday. 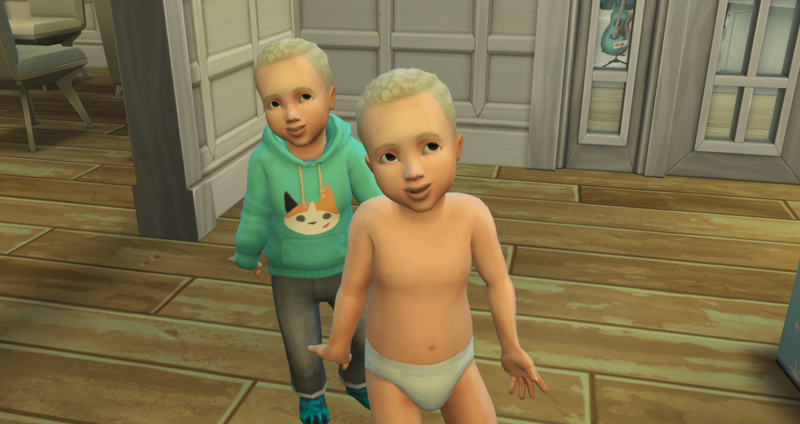 They are 6 days from aging up – so they can have their birthday any time now. 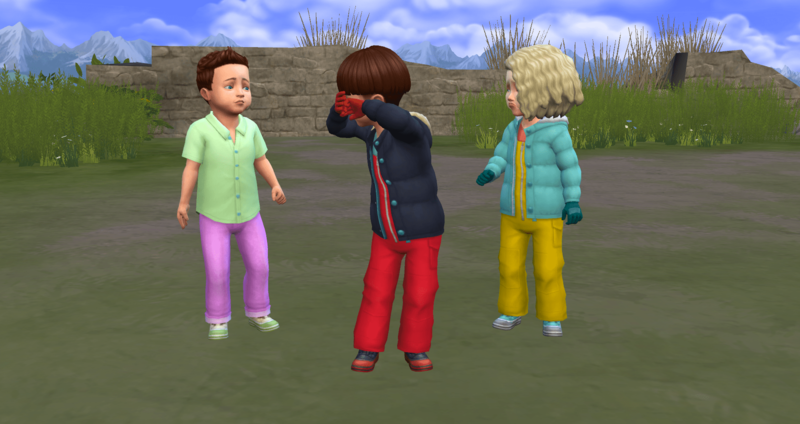 So they get to be the first kids to spend points on moodlet solvers. You want to know who isn’t a slow-poke? That would be Sahara. 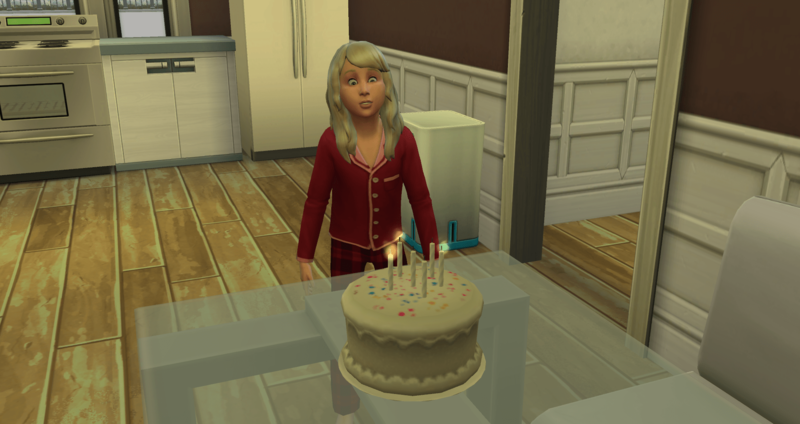 She is ready for her birthday cake, yes she is. 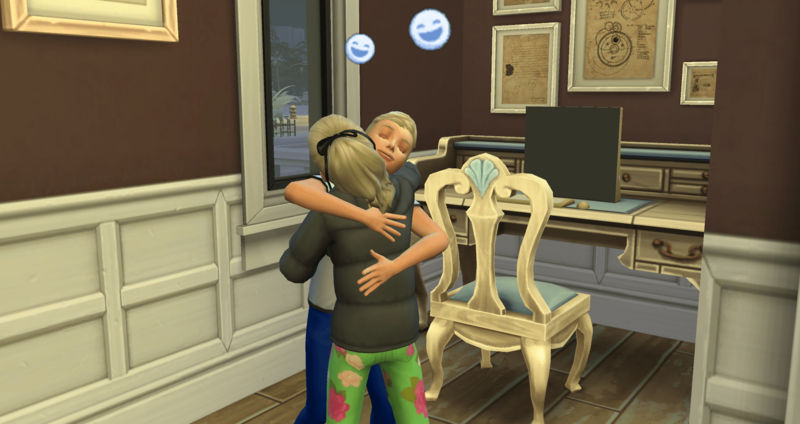 Cleaning up their moodlets plus working hard makes up for the crappy week at work. 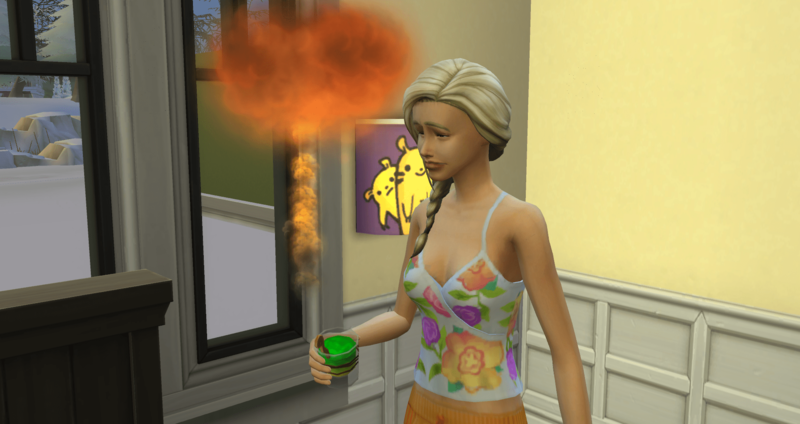 Both teens are now up to the last bubble. So, if they can have a relaxing Saturday, then work hard Saturday evening, they should earn their promotion. This would let them move out this weekend. Fingers crossed. 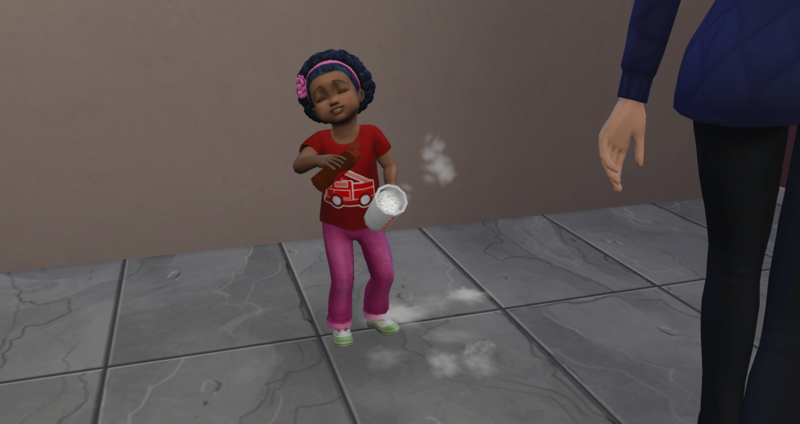 Meanwhile, since I figured out which set of twins need to complete their aspirations, Niagara is working hard on her social. BFF will always be the twin, if a twin is an option. Monkey around is such a crap shoot – it is mischief but sometimes they like it, sometimes they don’t. They didn’t. But BFF they are. 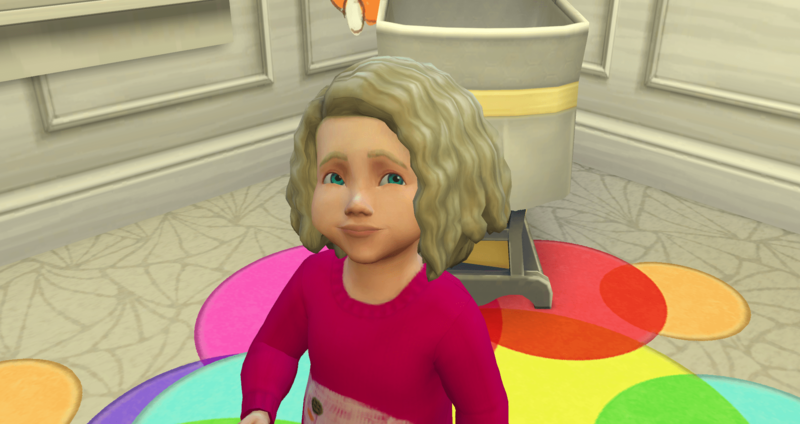 Now she just needs 3 children and 2 adults and to max out social. Normandy, on the other hand, needs to get back to typing – he is still a long way from finishing motor. 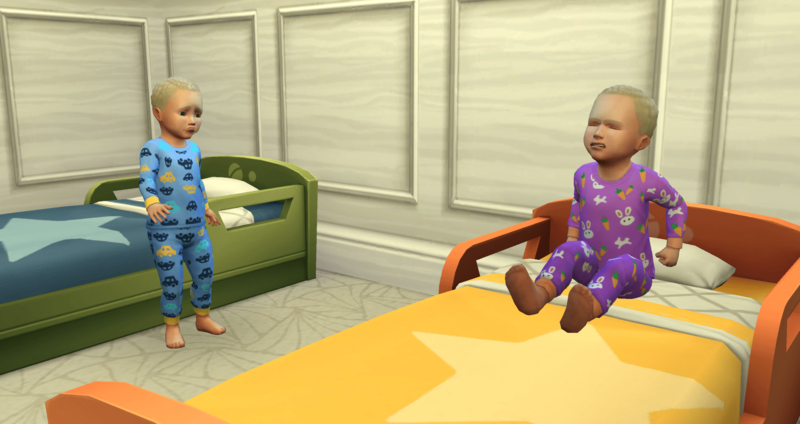 Niagara moves in on the older twin’s conversation to continue working on social. 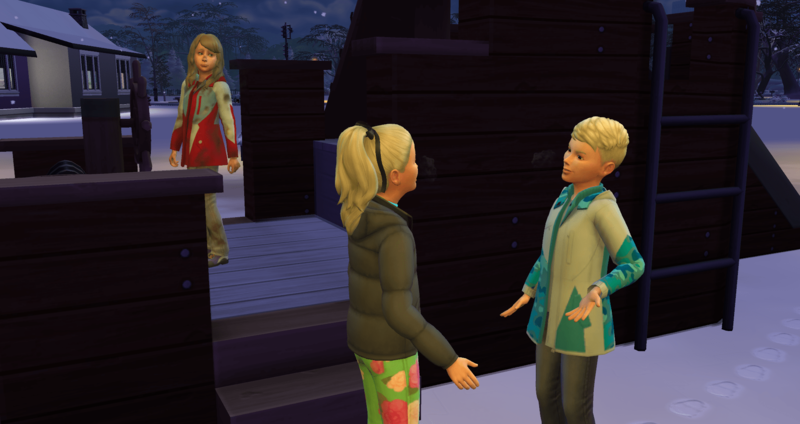 She just butts right on into their conversation. And, I think this is where I am going to stop this for this update, just for length.